The perfect marriage: a fruit cocktail in a prawn cocktail sauce; sweet and savoury, vegetarian and no cooking. Everyone’s happy. Simply make a fruit salad (melon, pineapple, cherries, peaches etc.) and a Marie Rose sauce (equal parts of ketchup and mayonnaise). Mix the sauce together and pour over the fruit. Sort of a prawn cocktail surprise; the surprise being that there are no prawns. 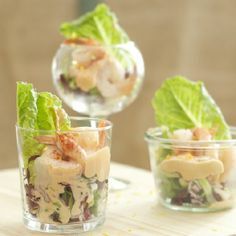 Serve in bowls with lettuce or some other salad leaves, or in drinks glasses for extra ponciness. Season to taste. Ground hot paprika is good for extra flavour and colour. Garnish with lemon wedges to make it look even more posh: bish, bash, bosh.